Do you have your green outfit picked out for St. Patrick's Day 2013? 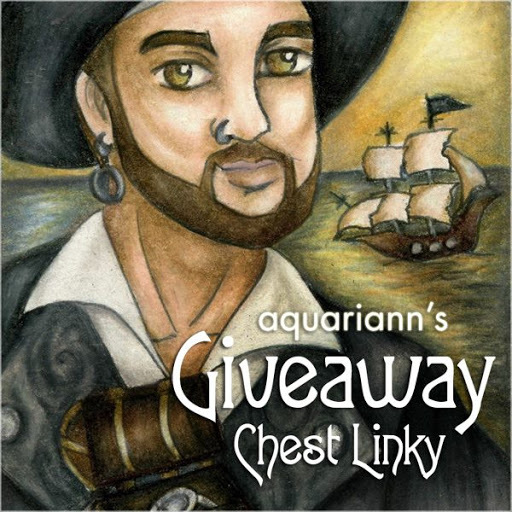 Branch out to Athenianaire, Beadmask, oBo Creations, Thyme2dream, 7PM Boutique, Life is the Bubbles, and Kunoichi Creations for green necklaces to buy as Saint Patrick's Day gifts to yourself. Athenianaire's green butterfly wing necklace is a double sided glass pendant on a swiveling bail so it's almost like getting two pendants for the price of one! The stunning side shown is a wing of Callithea philotima, also known as Darwin's Butterfly. But be careful the pendant doesn't turn if it's the only green you wear on St. Patrick's Day - you don't want to get pinched! The other side features the wing of a Morpho menelaus butterfly, known for its iridescent aqua blue color. 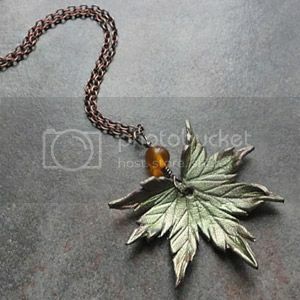 Beadmask's green leaf necklace was hand crafted from high quality tooling leather. It was hand cut, shaped, carved and painted to resemble a Japanese maple leaf - although she's been told it's been giddily mistaken for a pot leaf. Either way you see it, the leaf is a gorgeous shimmering olive green. It is accented with a single Baltic amber bead. The pendants hangs from a 20" chain with an antique copper finish that closes with a lobster clasp. 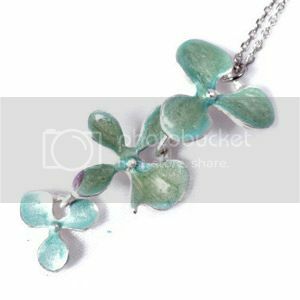 oBo Creations' silver flower necklace shimmers mint green in a subtle dragon skin pattern. 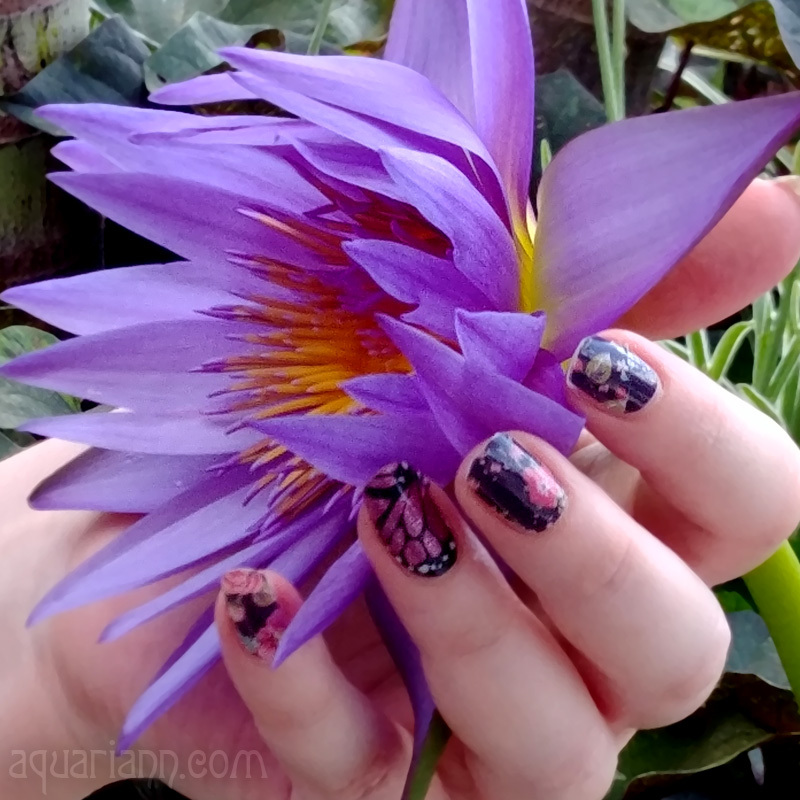 The unique effect is achieved from her special hand painted technique. The pale petals are set on matte silver and finished with high quality rhodium plating to resist tarnishing. The pretty pendant features three flowers that are 36x7mm with a tiny metal pearl in the center of each. They hang delicately from a matching silver chain that measures 50 cm. Thyme2dream's art nouveau necklace is inspired by a scene from Lord of the Rings: "In the spring, Rivendell's mighty Oaks and graceful Beech trees come alive again and the valley sings the song of the waterfalls filled with melting snow from the Misty Mountains." 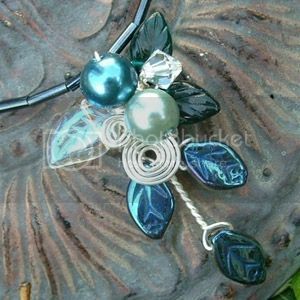 The fantasy pendant is crafted from Non Tarnish silver, Czech glass leaf and pearl beads and genuine Swarovski crystal bicones. The magical necklace is part of her Rivendell Spring Forest series. 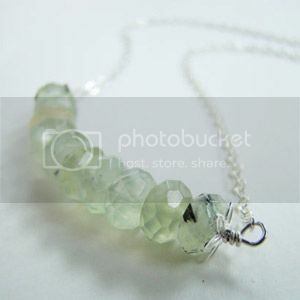 7PM Boutique's green gemstone necklace is an everyday option to add a touch of glamor and subtle shine to any outfit. Faceted 8mm natural green garnet gemstone rondelles hang gracefully from a delicate sterling silver chain. This simply beautiful necklace measures 18" and closes with a crab clasp. Wear this piece of jewelry to a St. Patty's Day party and you'll still look elegant even after a few too many green beers or Irish car bombs! Life is the Bubbles' magic bottle necklace is inspired by Disney’s The Princess and the Frog. After staring into the sad, round eyes of a frog that's pleading, 'Oh, please, dear princess! Only a kiss from you can break this terrible spell that was inflicted on me by a wicked witch!'" - what lady could resist? 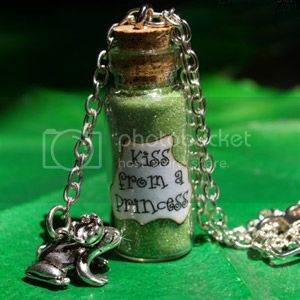 The bottle of green glitter is 1.5" tall with a frog charm hopping along beside it. The fairy tale pendant is attached to a 20.5" chain. Kunoichi Creations' spiral wing necklace will lift your spirits. 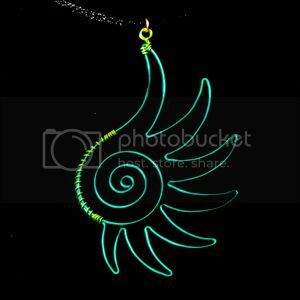 The pendant is shaped in artistic wire to resemble a wing with a central spiral. The striking design is approximately 1.5" wide by 2.5" tall. You can buy the pendant as pictured in green/chartreuse for St. Patrick's Day, or get it custom made in any of several different enameled copper wire colors to match more of your wardrobe. The price includes a 30" black satin cord. I always end up forgetting to wear green on St. Pat's! 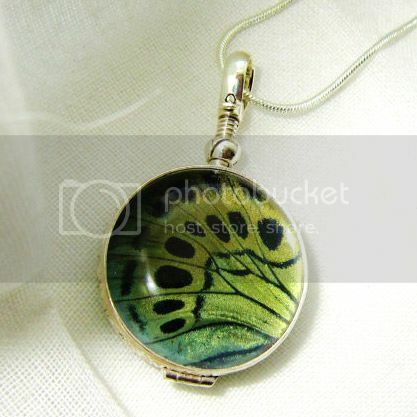 These are gorgeous, I especially love the butterfly wing pendant though- wow! That is right, ST Patrick's Day is coming. I might have to make some jewelry using green.